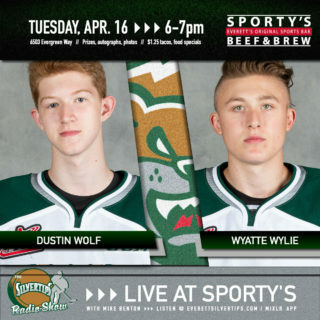 Game 4, second round of the WHL Playoffs between the Silvertips and Spokane Chiefs … it is the 5th time the two teams meet in the postseason (first since 2015, won by the Silvertips, 4-2) … the Tips went 6-0-1-1 against Spokane in the regular season and are 12-4-1-1 in Spokane, in the last five years … the Silvertips are meeting Spokane for the 5th time in the postseason … Connor Dewar and Bryce Kindopp led the Silvertips with 10 points in 8 meetings for the regular season … the Tips are 12-17 lifetime in Game 4 situations, and 8-6 on the road. 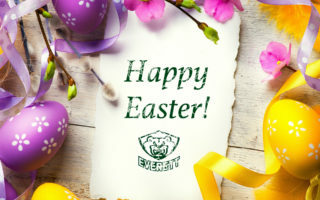 SPO 3 – EVT 1 (4-10-19) // AOTW ARENA // EVERETT, WA: Bailey Brkin turned in 29 saves and Adam Beckman broke a tie game in the third period to help get the Spokane Chiefs past the Everett Silvertips, 3-0 in Game 3 of the second round of the WHL Playoffs before 3,831 fans on Wednesday night at Spokane Arena. 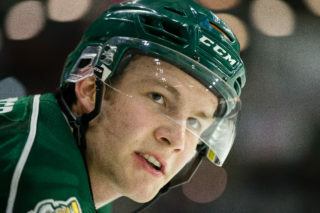 Robbie Holmes netted the Silvertips single goal while Dustin Wolf turned away 18 of 20 shots on goal. 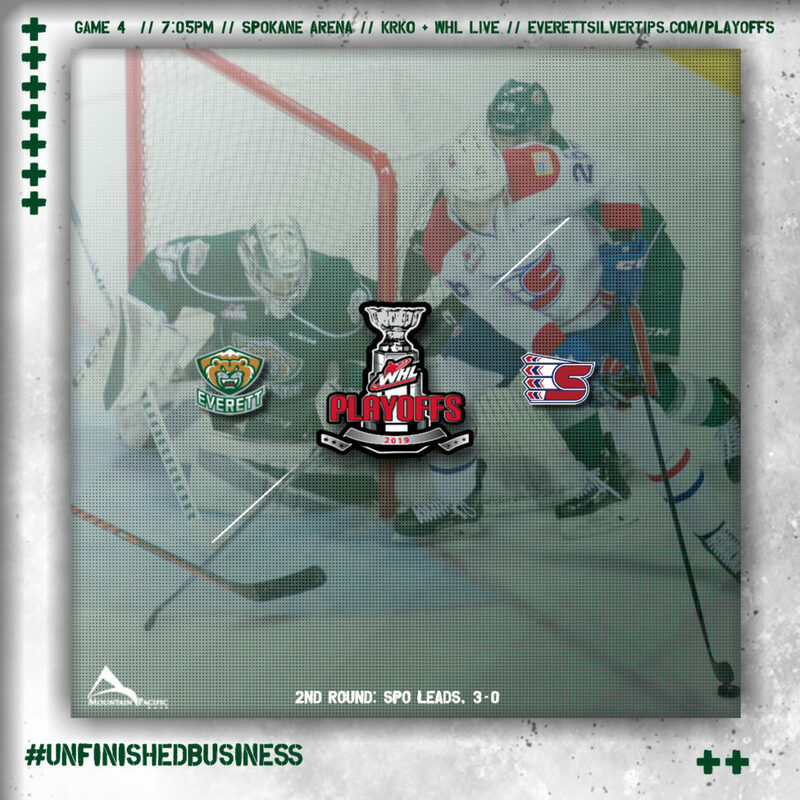 The Tips, now face a task to become the third team in WHL history to rally from a 3-0 deficit to win a playoff series. 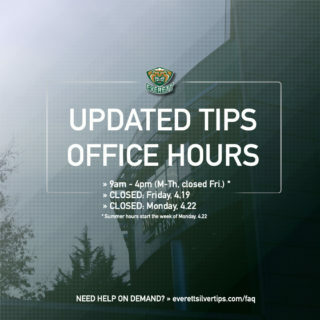 CONTINUING TO BUILD: The Tips have captured their seventh U.S. Division banner … their division title in 2018-19 is their third consecutive and they have won the U.S. Division four of the last five seasons … the Tips have the longest active playoff streak in the WHL (16 seasons) … on Apr. 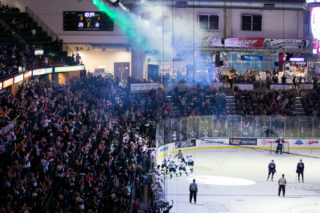 11 they were named recipient of their second straight WHL Western Conference Business Award. ROAD RULES: The Tips went 23-9-0-2 on the road in the regular season and led the Western Conference in road victories (23) … they owned a +36 goal differential on the road, tied for second highest in the WHL with Moose Jaw.